At sixty-three years of age, William Grayâ€™s bearded appearance attracted an invitation to fulfill the unique role of being the first Australian Father Christmas. John Martin & Co in Adelaide, South Australia, with Gray’s help, developed a “Magic Cave” concept to entice parents with children to visit their department store. A small room was cleared and artists decorated the walls into picturesque murals of fairytales to delight children. Hessian bagging, soaked in plaster, was molded onto wooden frames creating surfaces which were transformed into icy stalagmites and stalactites. A fireplace and comfy chair was arranged for Father Christmas to meet the children with a decorated Christmas Tree completing the scene. Unlike the American Santa set ups of the period, the Magic Cave was a completely themed environment. 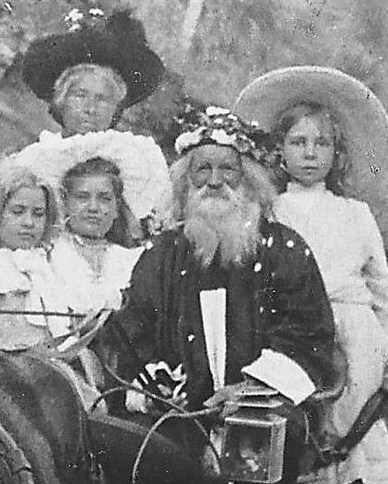 William Gray served as Father Christmas to the children of Australia beginning in 1897 and continuing for nearly a decade.